A Critical Look at Defeat Autism Now! and the "DAN! Protocol"
A Critical Look at Defeat Autism Now! Defeat Autism Now! (DAN! ), which was closed down in 2011, was a project of the Autism Research Institute (ARI), a nonprofit organization founded in 1967 by Bernard Rimland, Ph.D. (1928-2006). Rimland, who was a research psychologist, helped to dispel the long-held view that autism was caused by faulty mothering . But later in his career, he incorrectly concluded that autism was caused by vaccines and could be effectively treated with detoxification and dietary supplements. In 1995, ARI sponsored a 3-day meeting that was attended by about 30 professionals who discussed what they were doing and what they believed had worked for them. These determinations were not derived from well-designed studies but were based on clinical impressions, observations reported by parents to the treating physicians, and responses to questionnaires that ARI had collected. The meeting generated a consensus document—co-authored by Baker and Pangborn—that was published in 1996 as Biomedical Assessment Options for Children with Autism and Related Problems, but was often referred to as the DAN! Clinical Manual" or DAN! Protocol." In 2005, after undergoing five revisions, the report was extensively rewritten, revised once more, and published by ARI as a large book called Autism: Effective Biomedical Treatments. The original version of the book covered 41 pages. The 2005 version, which I own, has about 330 pages and measures 8.25 x 10.75 inches . I estimate that it contains about 220,000 words. In 1967, Rimland began encouraging parents to rate their experiences with various treatment methods. He thought that if enough were collected, the data might suggest which treatments should be studied more closely. In 2009, ARI reported that data had been collected from more than 27,000 parents . The 2009 report included data on about 40 standard drugs and about 40 types of nonstandard treatments with the percentages rated as "Got Worse" (worse behavior), "No Effect," or "Got Better." The fourth column, "Better:Worse," is the number who reportedly improved divided by the number who got worse. The figure to the right is a small portion of the non-drug table. ARI's treatment effectiveness survey merely asked parents rate interventions on a six-point scale. It did not ask about dosage, length of time given before the rating was made, the criteria parents used to give their rating, or whether other things were done at the same time. The survey process provided no mechanism for follow-up communication if an "improvement" turned out to be temporary and the parent later concluded that the product "stopped working." The ratings were not standardized to ensure that all the criteria for judging improvement were the same from one parent to another. There is no reason to believe that the parents who submitted reports were a representative sample of parents with autistic children. It is far more likely that generally regarded "biomedical" interventions as worthwhile. There was no way to determine whether the reports even reflected a representative sample of the experiences of those who reported. There is good reason to believe that the treatments have been given to tens of thousands of autistic children and that many of then received many of them. But during the 40+ years the survey was run, the average number of reports per year was less than 700 and the average number of nonstandard items covered in the reports was between 2 and 3. Nobody knows whether the children encompassed by the reports actually did better than similar children whose parents did not report. Nor is it known why the number of items reported were much fewer than the number of items tried. But it is well known that people are more likely to report positive experiences than negative experiences. Positive reports could have been the result of coincidence, such as a day-to-day variation of a child's behavior, the result of educational measures, good parenting, or the natural tendency of children to mature as they get older. To measure effectiveness, it is necessary to compare the people being treated with others who do not receive the treatment. Because wishful thinking and other biases can influence how observations are received, it is also important that outcome evaluations to be done by third parties who are not emotionally involved and who do not know what interventions have been used. The bottom line is that the survey data identified measures that parents have tried, but they should not be considered evidence of effectiveness. The only way to determine effectiveness is to perform randomized, double-blind, controlled studies on one or a few treatments at a time. So far, very few of the supplements, diets, or nonstandard drug treatments covered by the survey have been subjected to such testing, and the few that have have not demonstrated benefit . The "Got Better" numbers in the tables may actually reflect something else. Forty-three percent of the parent reports said that their child had improved after taking intravenous secretin, a hormone that is administered over a period of weeks to months. Secretin has been studied enough to know that it is not effective against autism . Thus it is safe to conclude that the reported improvement following secretin was due to something else—and that whatever caused parents to give a high rating to secretin would also influence how they rated everything else. The average rating of the 28 items in the "Biomedical/Non-Drug/Supplements" section of the report was 47%, which is very close to the 43% for ineffective secretin. So rather than suggesting benefit, the "Got Better" numbers suggest little or no effect! Autism: Effective Biomedical Treatments wildly exaggerates the significance of the survey. On page 19, Baker refers to it as "a growing body of carefully compiled anecdotal data" which it certainly is not. Equally bad, in several places he omitted the "no effect" data and used the numbers in column 4 to represent effectiveness. For example, instead of saying that 46% of the reports said that vitamin C had helped, he reported that vitamin C was 20 times more likely to produce benefit than cause harm, which most readers will interpret as 95% effectiveness. I believe this is a serious misrepresentation. The DAN! Philosophy and "Protocol"
Autism and related problems are the symptoms of dysfunction of the neural, immune and/or digestive systems which occur in individuals genetically sensitive to such factors as sub-optimal nutrition, food intolerances, microbial overgrowth and toxins. Appropriate treatment entails identifying and alleviating the problems causing the symptoms in that individual, rather than merely attempting to suppress the symptoms through the use of psychoactive drugs. An epidemic of autism is currently taking place in North America and many other parts of the developed world. Diagnostic and treatment options should be consistent with an evolving picture of the environmental causes of the epidemic. Each child is different and his or her lab testing and responses to treatment should be the guides to clinical intervention. Parents are both the source and the recipients of much of our knowledge concerning effective treatments. They should be embraced by clinicians as full participants in the search for answers for their child. DAN! practitioners make every effort to create an environment in which ongoing clinical detective work takes place in an atmosphere of an intelligent dialogue between parents and professionals. Such a dialogue should include the child, who may be listening, even when he or she appears inattentive. Nutritional deficiencies and special needs—these concern primarily Vitamins B6, B12, A and magnesium, calcium, selenium, zinc, and omega 3 fatty acids. Gut dysfunction due to multiple factors, including suboptimal nutrition, infections, antibiotics, and NSAIDs. Microbial overgrowth including viral infections in susceptible children after a) certain vaccines, b) intestinal parasites, and c) bacterial and yeast overgrowths in the gut. Toxins, such as PCB's, and particularly heavy metals, such as mercury from environmental sources and certain childhood vaccines. Food intolerance, including intolerance of gluten and casein (found in grains and dairy), immunoglobulin-mediated food allergy (not always evident on skin-testing), intolerance of so-called Feingold foods and additives (phenolic compounds), and excitotoxins (certain flavor enhancers from the MSG family). "We do not have a protocol for treating autism. We have a way of addressing individuality in the context of an epidemic that has environmental causes." "Our patients have responded to a variety of approaches that depend of the makeup of each child." "Every treatment is really a diagnostic trial"
"The sequence of options may change depending on the response to treatment." Please resist any inclination to view the treatment options . . . as being aimed at any particular symptom . . . Each treatment, when effective, treats all symptoms, though not always to the same degree. When a particular therapy addresses a particular need to get or be rid of a crucial item in an individual's biochemical and immune balance, the result is healing of the whole organism." DAN! 's most harmful activities were its promotion of chelation therapy and opposition to vaccination. In 2001, DAN! convened a Detoxification Consensus Conference and issued a position paper which claimed that mercury in some vaccines could cause autism and that treating autistic children with chelation therapy could cause many of them to improve . The paper was supported in part by a grant from Kirkman Laboratories. Following another conference, the paper was updated in 2005 . Both versions of the statement claim (falsely) that "body burden" of mercury can be measuring the urinary mercury concentration after a chelating drug is administered. This procedure, called provoked or challenge testing, has been denounced as meaningless by the American College of Medical Toxicologists  and labeled as "below the standard of care" by the Oregon Medical Board . The 2005 version of the DAN! mercury-detoxification paper also stated that children can be exposed to mercury through maternal seafood consumption, maternal dental fillings (amalgam), and childhood vaccines. The theories and medical models on which these therapies are based are not universally accepted in the medical community and are being vigorously studied by a number of researchers. The clinical evidence supporting these therapies is compelling but no well-controlled outcome studies have yet been performed; the evidence is largely based on clinical experience at this point. . . .
At the present, it is impossible to determine which patients will benefit from these therapies with great accuracy. Some patients who seem to be perfect candidates will have no improvement and others who seem to have little to recommend the therapy will show marked improvement [14:21]. Before long, I was invited to join a conference to set up a “protocol” for using chelation in the treatment of autism. I attended and, for the first time, got to see many of the leading lights in “non-conventional” autism treatment outside of the conference hall. Most of these people appeared to hold sincere beliefs but based their assessment of their therapeutic efforts on anecdotes, surveys, and simplistic studies. I thought they would welcome a more rigorous scientific investigation of their methods and results. After the conference, I was asked to compile a “consensus report.” I readily agreed, thinking that my editing could temper the unscientific thinking of the rest of the group. However, my editorial control turned out to be nil. The final report included large tracts of material that were the pet beliefs of the senior members of the organization. Worse yet, even though I disagreed with significant portions of the report, my name was listed as sole author! I have been able to get my name removed from the "official" document, but Internet copies of the original abound . The Omnibus Autism Proceeding offered the people who blamed autism on vaccines an opportunity to prove their case in court. In 2001, parents began filing petitions alleging that MMR vaccinations, the thimerosal ingredients in certain other vaccines, or a combination of factors might be causing or contributing to autism. When it became clear that thousands of cases would have similar allegations, the Omnibus Autism Proceeding was established. To proceed efficiently, the parties agreed to process "test cases" for each "general causation" theory presented by the Petitioners’ Steering Committee. Ultimately, two such theories were advanced: (1) MMR (measles/mumps/rubella) vaccines and thimerosal-containing vaccines can combine to cause autism, and (2) thimerosal-containing vaccines can cause autism. Three Special Masters were each assigned one case for each theory. Evidentiary hearings on the first theory were conducted in 2007, after which the parties filed additional documents and briefs. In addition to 5,000 pages of transcripts and well over 700 pages of post-hearing briefs, the records in the first three cases contain 939 medical articles (a typical vaccine case presents about 10). A total of 50 expert reports were filed and 28 experts testified, whereas typical vaccine cases present 2-6 experts. Evidentiary hearings on the second causation theory were conducted in 2008 and generated 3,200 pages of transcripts. The evidence included over 1,200 articles and excerpts from the medical literature and testimony from 20 experts. During the proceedings, pediatrician Elizabeth A. Mumper, M.D, testified several times in support of the families who were seeking to prove that vaccines could have caused their children to become autistic. Mumper, who said she had treated between 400 and 500 autistic children, also served as ARI's medical director and director of physician training and has signed onto the 2005 mercury detoxification paper. In 2008, under cross-examination, (a) it was still true that no well-controlled outcome studies had been performed on the components of the DAN! approach, and (b) the theory that thimerosal can contribute to autism is not accepted by the scientific community . But she also said that because children on the autistic spectrum are not all alike, the fact that a study of many children would find no effect would not rule out the possibility that a subset of children would benefit from that method . In 2009, in a stunning trio of decisions, Special Masters concluded that no credible evidence exists that MMR or thimerosal-containing vaccines can combine to to cause autism. In 2010, in three more cases, the Special Masters concluded that the thimerosal itself was not a causative factor. The decisions also criticized doctors who base their treatments on these notions . When I reviewed the transcripts, I found that at least three of the six families had attended DAN! conferences where they met the doctors who treated their children. From 2001 through 2011, the ARI Web site published the names of "DAN! doctors in a clinical registry that listed their contact information, "specialties," DAN! conference attendance, and, in most cases, which of 33 modalities they offered. The modalities were Actos, amino acids, anti-inflammatories for inflammatory bowel disease (Rx), anti-yeast diets, antifungal pharmaceuticals, antiviral medications, chelation (IV), chelation (oral), chelation (rectal suppositories), chelation (transdermal products), colostrum, diet avoiding food allergens, digestive enzymes, essential fatty acids supplementation, Feingold diet, glutathione (IV), gluten and casein-free diet, heavy metal detoxification, hyperbaric oxygen therapy (hard chamber), hyperbaric oxygen therapy (soft chamber), intravenous immunoglobulins (IVIG), low dose naltrexone, low oxalate diet, methylcobalamin (injection), methylcobalamin (nasal), nutriceuticals, probiotics, secretin, specific carbohydrate diet, spironolactone, transfer factor, vitamin/mineral supplementation, and vitamin C and/or minerals (IV). The 2011 registry included 366 practitioners, of which 166 were medical doctors, 30 were osteopathic physicians, 66 were chiropractors, 60 had a naturopathic degree, 16 were nurses, 4 were physician assistants, 3 were optometrists, 2 were acupuncturists, and the rest did not indicate the nature of their license . In 2010, ARI announced that it had decided to stop using the name "Defeat Autism Now!" because (a) it did not accurately describe the medical approach to understanding and treating autism, (b) some people were offended by the phrase, and (c) the Divers' Alert Network, which claimed ownership of the word "DAN," had asked ARI to stop using it. ARI also announced that it had resolved to "freeze" the clinician registry and remove it from ARI's Web site because (a) although clinicians receive similar and consistent information at the seminars, there is no uniform way patients are subsequently treated, (b) although the registry merely listed people who had attended DAN!s clinical seminars, many people perceived the registry as a list of recommended doctors, and (c) ARI did not certify doctors and could not assure that every practitioner on the list provided high-quality service . ARI also posted a notice that attendees were not entitled to refer to themselves as "DAN!-certified." But if you Google "'DAN!-certified' + autism," you will find that many do so. After ARI terminated its DAN! project, Dan Rossignol, M.D., launched the Medical Academy of Pediatric Special Needs (MAPS) to perpetuate the DAN! practitioner network. In May 2015, the organization's online clinician directory listed 49 members in the United States, of which 33 were medical or osteopathic physicians. I believe that many of the things "DAN! doctors" do are below the standard of care. So it did not surprise me when I searched the licensing board sites and found 67 (about 15%) of the medical and osteopathic physicians listed in DAN! 's Clinical Registry between 2001 and 2011 had been subjected to government actions . The reasons varied considerably. Seven were related to practices that are central to the DAN! approach: Roy E. Kerry, MD, Richard E. Layton, MD, Seshagiri Rao, MD, Alan Schwartz, MD, Stephen L. Smith, MD, Kenneth P. Stoller, MD, and Anjum Usman, MD. At least 18 others were related to the use of nonstandard or pseudoscientific methods. The rest included failing to render adequate standard care; inadequate recordkeeping; misleading advertising; improper use or prescribing of narcotic drugs; aiding or abetting unlicensed practice; income tax evasion; and research-related improprieties. Perhaps the most notable was Dr. Smith, who had diagnosed nonexistent lead toxicity and prescribed about 25 inappropriate products to an autistic teenager. In 2014, he was placed on probation and was barred from continuing to treat patients under the age of 18. In 2009, the Center for Autistic Spectrum Disorders in Austin Texas, was raided by the FBI (for suspected insurance fraud) and permanently closed its doors. Doing business as Care Clinics, its staff diagnosed heavy metal toxicity in virtually everyone who came for an evaluation . In 2010, the British General Medical Council (GMC) struck Dr. Andrew Wakefield from its medical register after concluding that he had acted dishonestly and irresponsibly in connection with a research project and its subsequent publication. The GMC's concern centered on a study of children by Wakefield and twelve colleagues that linked the measles-mumps-rubella (MMR) vaccine with autism and bowel problems. The Lancet published the study in 1998, and sensational publicity caused immunization rates in the United Kingdom to drop more than 10%. Subsequent research found no connections—and, in 2004, ten of the study's co-authors renounced its conclusions. After GMC's findings were announced, The Lancet retracted the paper . The GMC's action permanently barred Wakefield from practicing medicine in the United Kingdom. In 2012, the Maryland State Board of Physicians revoked the medical license of Mark R. Geier, M.D., Ph.D., after concluding that he had inappropriately diagnosed patients with precocious puberty and administered inappropriate chelation therapy. Geier, who operated a chain of autism clinics, is also the most prolific author of journal articles claiming to show a link between autism and mercury toxicity. Many courts excluded his testimony as an expert witness , but he had a substantial following among parents. Get a complete copy of the child's medical records so that what has happened is documented. Send a copy of the records to the state licensing board with a request that it investigate. It is not necessary to provide "proof" that something is wrong because the board can make its own determination. After you get the records (so that they cannot be altered), inform the doctor that want your child discharged from his or her care and that you have asked the state licensing board to investigate. Faced with this degree of assertiveness, most doctors will discharge the child from their care. Even though well-designed studies might demonstrate that something (such as chelation or secretin) doesn't work, these studies can be ignored because each child is an individual and may still respond positively to any intervention. I do not believe that science works that way. And neither should you. Bernard Rimland. Wikipedia, accessed May 10, 2015. Barrett S. Commercial hair analysis: A cardinal sign of quackery. Quackwatch, Aug 2, 2010. Barrett S. How "provoked" urine metals tests are used to mislead patients. Quackwatch, May 26, 2017. Brudnak M and others. The Kirkman Guide to Intestinal Health in Autism Spectrum Disorder. Lake Oswego, OR: Kirkman Laboratories, 2001. Rimland B. Sidney Baker, M.D., and the Medigenesis breakthrough. Autism Research Review International 15(1):3, 2001. Rimland B. The history of the Autism Research Institute and the Defeat Autism Now! (DAN(!) project. In Edelson SM, Rimland B, editors. Recovering Autistic Children. San Diego, CA: Autism Research Institute, 2006, pp 15-25. Pangborn J, Baker SM. 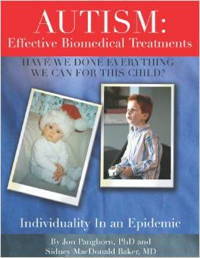 Autism: Effective Biomedical Treatments. San Diego, CA: Autism Research Institute, Sept, 2005. Parent ratings of behavioral effects of biomedical interventions. ARI Publication 34, March 2009. Our evaluations of autism interventions, treatments and therapies. Research Autism Web site, accessed May 16, 2015. Edelson SM. Telephone conversation with Dr. Stephen Barrett, May 14, 2015. Williams K and others. Intravenous secretin for autism spectrum disorders (ASD). The Cochrane Collaboration, 2012. Defeat Autism Now! (DAN!) practitioner list referral questionnaire. Center for the Study of Autism Web site, archived Oct 30, 2006. Baker SM and others. Defeat Autism Now! Mercury detoxification consensus group position paper. San Diego, CA: Autism Research Institute, May 2001. Baker SM and others. Treatment options for mercury/metal toxicity in autism and related developmental disabilities: Consensus position paper. San Diego, CA: Autism Research Institute, Feb 2005. Taylor LE and others. Vaccines are not associated with autism: An evidence-based meta-analysis of case-control and cohort studies. Vaccine 17:3623-3629, 2014. Laidler, JR. Through the looking glass: My involvement with autism quackery. Autism Watch, Aug 7, 2004. Mumper E. Testimony, May 16, 2008, p. 145. In King v Secretary of Health and Human Services. U.S. Court of Federal Claims case 1:03-vv-00584-UNJ, filed July 1, 2008. Mumper E. Testimony, May 30, 2008, p. 106. In King v Secretary of Health and Human Services. U.S. Court of Federal Claims case 1:03-vv-00584-UNJ, filed July 1, 2008. Barrett S. Omnibus Court rules against autism-vaccine link. Autism Watch, Oct 6, 2010. Defeat Autism Now! (DAN!) clinician registry: Implementing the Defeat Autism Now! consensus report. Center for the Study of Autism Web site, archived April 24, 2011. Moving forward (2011). ARI Web site, accessed May 15, 2015. Barrett S. Government actions against DAN! doctors. Autism Watch, May 23, 2015. Barrett S. The Rise and Fall of CARE Clinics and the Center for Autistic Spectrum Disorders (CASD). Autism Watch, Jan 23, 2013. Barrett S. Lancet retracts Wakefield paper. Autism Watch, May 29, 2010. Barrett S. Dr. Mark Geier severely criticized. Casewatch, July 11, 2012. This article was posted on June 1, 2015.